Welcome to my new version of the Letter A preschool printables! I’m updating a few letters and had some fun ideas for Apples so here they are! 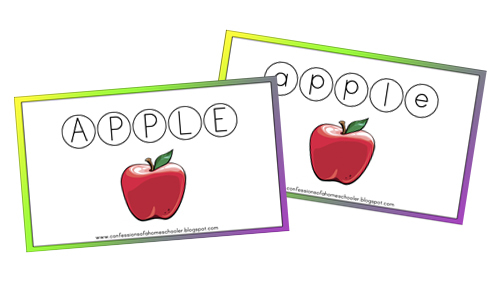 Apple Letter Matching: This is a fun letter matching activity, that practices both upper and lowercase letters recognition! If you’re looking for more challenge, use the uppercase card with the lowercase letter disks or visa versa! 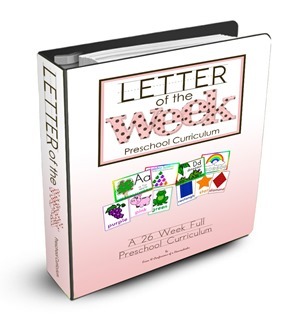 (The download includes upper and lowercase letter disks and activity cards) Click here to see how to make the letter disks. Letter A Poke Page: Instead of tracing, we are going to use a toothpick, or we have these cute Oversized Push Pins, to poke holes through the paper in the shape of the letter. Print on regular paper for easier poking, and do this one on carpet 🙂 Another idea would be to hole punch along the lines of the letter as well. Both work on motor skills! Letter A Coloring Page: We color this, paint it, or use markers. I found some that fit my 3 year old well, they’re called Pip-Squeaks Washable Markers, we also use Do-a-Dot Art Markers with this! Letter A Scissor Skills Practice: Simple print and let your child try cutting along the lines! Letter A Pattern Activity: Cut out the game pieces on the bottom and use them to complete the pattern on the card above. 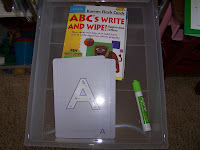 Letter A Scavenger Hunt: Fill the box with things that start with A! Some ideas: apple, acorn, avocado, ant. 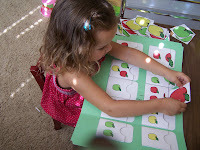 Letter A Shapes Matching Puzzle: Simply cut these little apple cards in half for fun shape matching puzzles. Make sure to discuss each shape as you go! Letter A Size Sorting: Put these in order small to big or big to small then discuss which is largest, smallest and medium. 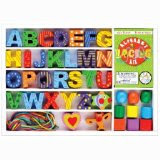 Letter A Cut-n-Paste: Let your child cut out the tree and apples and glue them onto a sheet of construction paper. This practices scissor skills as well as pasting, plus it’s just fun! Letter A Pre-Writing Practice: I laminated these then cut them out along the lines, hole punched the corner and used an o-ring to bind them together like a little booklet like the Butterfly Sample below. 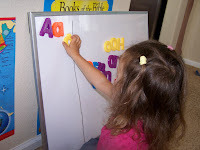 Use dry-erase markers to practice writing numbers. Apple Lacing Card: I make sure to laminate this one for durability, then punch with a hole punch every inch or so for lacing practice. Teach them patterns to do with this as well, like up from the bottom each time, or in-out-in-out sewing. Whatever pattern you can think of. 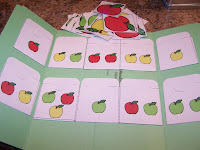 Apple math file folder game downloaded from File Folder Fun. Play Balloon Volleyball: Balloon Volleyball is basically a toddler-friendly version of regular volleyball. Kids take turns batting a balloon up in the air, with the goal of trying to keep it off the ground as it floats downward. You can shout out words that start with the letter “A” each time you hit the balloon! Kumon ABCs Uppercase Write & Wipe Flash Cards, they also have lowercase cards and 1-30 Numbers. Apple Prints: Cut an apple in half and make prints with paint! Thanks for always sharing your ideas! You are such a blessing to many of us homeschooling mamas!! Yea! I was wishing A was for apple instead of ant ; ) It fits in with fall. yehey.. thanks for sharing! wonderful! Yay! Love the apple pages. 😀 These will be great when we "officially" row "how to make an apple pie and see the world." 😀 Thanks so much for all you do! Erica-just have a question…will you use the A is for apple with your preschooler this fall, or do you think the activities will be too easy for her? Also, do you teach uppercase first, or lower? Thank you! These are fantastic! So many great ideas! I can't wait to use them with my son someday. Anonymous: I will probably do the A is for Apple just to change it up for her, we're repeating the activities this year b/c I don't want to put her into kindergarten at 4!